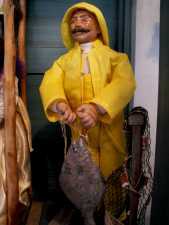 -----There is a romance surrounding the myth of the salt water fisherman, celebrated in sculpture, art, and humor. I suppose the same myths of romance clung to the vision of the tribal meat hunter back in the days before cows and pigs were raised on farms. On our passage to Alaska we shared the waters, harbors, and cafes with many fishermen, and a hardy, hard-working lot they are. 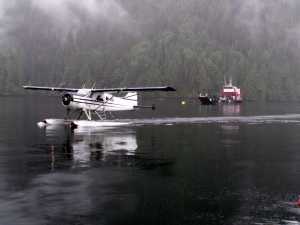 -----Then we landed in Kemtu, BC. Here we met the farmers of the sea at a dinner ashore and they invited us to visit them on their fish farm and learn about marine agribusiness. We took them up on their offer, and with dock friends aboard we headed out to Kid Bay on the north end of Roderick Island. 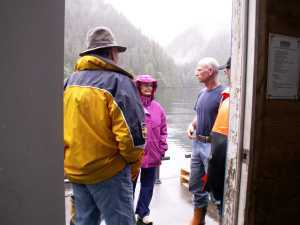 -----Jay gave us a happy welcome, and we tied off at their dock. He explained that farming fish was similar in many ways to farming on the land. Many of the crew had grown up on farms. -----"You need to start with good stock. 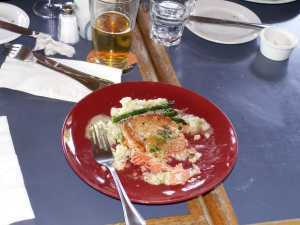 Our fish are Atlantic Salmon - they grow fast, have good meat, and are strong animals. 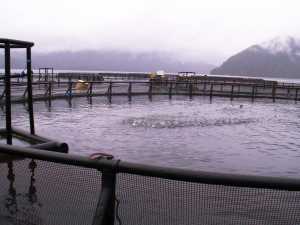 We put them in the pens as smolt and within eighteen months they grow to market size. We pulled one last week that had grown to 46 pounds in that time." -----"Then, like any good farmer, you have to keep your animals happy and fit. This requires good food. 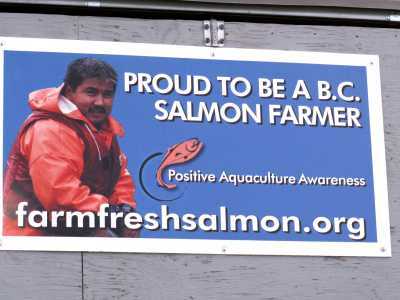 We have 840,000 salmon in our pens at this farm and they eat 20 bags of food a day at a cost of about $1,500. 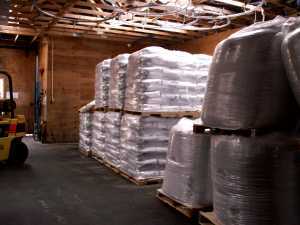 Done properly, we have found that one pound of feed translates into about one pound of fish. During one cycle of fish through our pens we use about eight million pounds of food"
-----"Confined animals must be carefully monitored for disease. It's our business to keep our animals healthy. You have probably read how farm salmon are infected with lice, and how these lice are transferred through intermediate hosts to wild salmon. This is being thoroughly researched and our job, here at the farm, is to prevent lice from attaching to our fish. We usually only have to disinfect our 'crop' once in their life cycle." 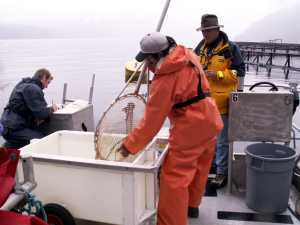 -----"We are constantly inspecting our fish for lice, and the Province sends an agricultural inspector regularly to our farm to check the fish. 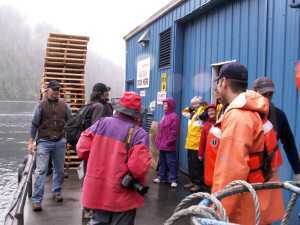 The inspector is here, so lets go out to the pens and see the fish -- we're proud of them." 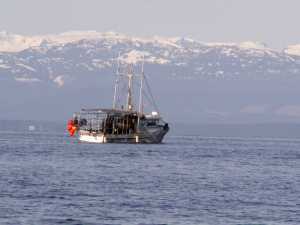 -----We clambered aboard his workboat and headed the short distance from the 'shack' to the pens. 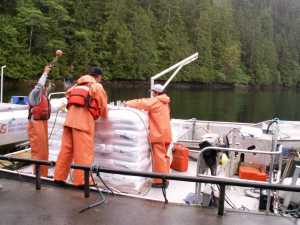 They were capturing fish, anaesthetizing them, weighing them and inspecting them for lice and for general health. 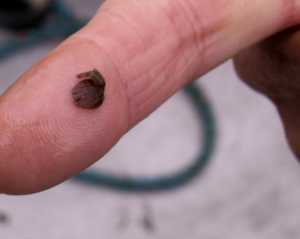 -----"No more than three lice per fish," the inspector said. "These fish look great. 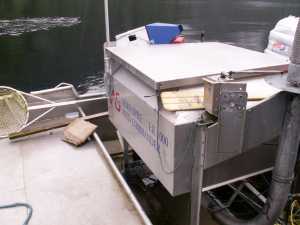 The Province and Universities are conducting research into locating pens, raising farm fish, and their effect on the native populations of fish. 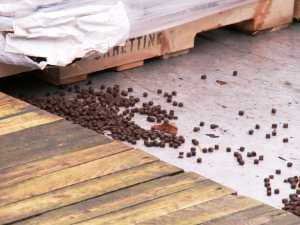 Pen locations are carefully chosen and permitted and the fish, like any farm animal, are inspected by agriculture agents. Personally, I think the concern about farm fish infecting and decimating native fish is overblown. Initial study results indicate little if any effect. Farms are often used as a scapegoat for problems caused by overfishing and 'natural' disease in wild fish. 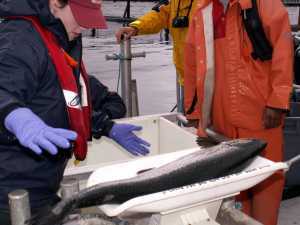 The Province wants to raise healthy fish and protect our native species, and I believe we are." 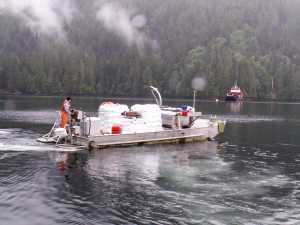 -----We watched the crew feed the fish and simply enjoyed seeing the fish leap and dance on the water. They certainly seemed as happy and healthy as any farm animals we have ever seen. -----"What's it like, working out here?," El asked. -----"Well, we work eight days on and six days off - a good schedule, we think. We have comfortable quarters, good food, internet and telephone connection with family and friends, and good movies to watch. We see wildlife, too -- we have had white bears visiting us almost every day last week. Our pay is good and the company gives us a bonus for raising strong healthy fish. 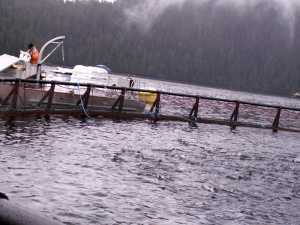 Most of us have worked for Marine Harvest, one of the largest fish farming companies, for many years and enjoy the work." -----"Sure, we miss our families during the work time but many of our farms are located closer to home and the men have shorter times away. 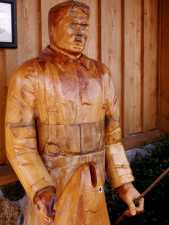 And, many jobs here in the north -- logging, fishing, ferry crew -- requiree extended periods away. 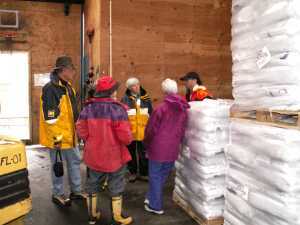 It's a price those of us on this crew are willing to pay to live and work here in the North Coast." 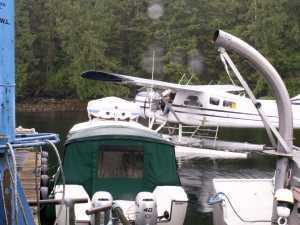 -----As we spoke with Jay (and his counterpart crew chief, James) a float plane circled camp and landed -- "My flight home," Jay said with a big smile. "Time to return to the bright lights of Campbell River."